Wilkinson County Superior Court Clerk Cinda Bright attended the 2012 mandatory continuing judicial education annual spring seminar for superior court clerks of Georgia on April 30th thru May 3, 2012. The conference, which provided twenty and one-half hours of training, was sponsored by the Superior Court Clerks’ Training Council and the Georgia Institute of Continuing Judicial Education. The training covered a large array of topics including an update from the Council of Superior Court Clerks on the new jury program and its institution into Georgia courts. The Council also gave instruction on using the newly mandated Supreme Court sentencing forms. The FBI taught a session on how to deal with sovereign citizens and their filings. The Georgia Superior Court Clerks’ Cooperative Authority informed clerks of notary public updates, mobile search applications, real estate e-filing, new training ideas, and future training topics. The Superior Court Clerks’ Association of Georgia’s Legislative Committee informed clerks of newly enacted laws which affect superior court clerks and the courts they serve. Six hours of training was dedicated to the Superior Court Clerks’ Certificate Program. All clerks are given the opportunity to participate in this program specifically designed for clerks of superior courts in Georgia. A superior court clerk must complete a seventy-two hour course consisting of specialized curriculum planned by the Carl Vinson Institute of Government and the Superior Court Clerks’ Training Council in order to become certified. In order to maintain the certificate, each clerk is required to attend a six hour update course annually to maintain the certificate. Certificate classes offered at the 2012 Superior Court Clerks’ Spring Conference included: Managing Human Resources, Change Management, What a Clerk Needs to Know about Drugs, Public Speaking and Media Relations. The mandated continuing judicial education training seminar gives superior court clerks an opportunity to stay informed of any changes that affect their offices as well as other valuable legal, technological, and office management techniques. The training, focused directly on the duties of superior court clerks’ offices, enables clerks to better serve the citizens of their counties. 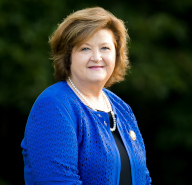 Cinda has served Wilkinson County as Superior Court Clerk since 1981.